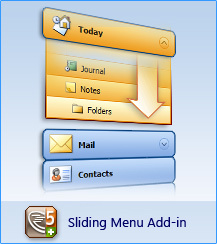 The AllWebMenus Sliding Menu Add-in allows you to create sliding menus where the subgroup will "hide" when not needed and "show" when necessary. You can easily create your web menus and set the submenu group to appear either as "drop-down" (non-sliding, standard menu mode) or as "sliding" (slide menu effect mode). If selected to appear as "sliding", the sliding submenu group will push the items of its parent group downwards when opening and in the same manner, it will pull items upwards when it closes. - Appearance: Menu slides when user clicks on its parent item (default) or when placing the mouse over it. - Appearance relative to: Display relative to "Left or Right Bottom Corner of Parent Item" or "Center Bottom of Parent Item". - Item indentation: Display indent to the number of pixels you prefer. - Margin: Set the margin (top, bottom, left, right) of the submenu group. - Set for the page content to be pushed (or pulled) when sliding menus appear (or disappear). This option is effective only when you position your menu relative to a page element or image. New Appearance Feature: You can set the submenu to slide when the user clicks on its parent item (default) or when he places the mouse over it. New (1) Sliding Menu Theme Pack (#41).